The aim of the Q&A series is to get an inside look into some of South Africa’s leading education academics, policy-makers and activists. This is the sixth interview in the series. 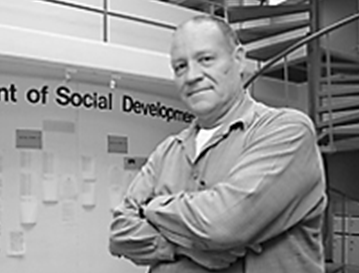 Eric Atmore is Adjunct Associate Professor of Social Development at the University of Cape Town and Director of the Centre for Early Childhood Development. 1) Why did you decide to go into education and how did you get where you are? I grew up in an environment where education and learning was of prime importance. My parents each had only modest schooling, Grades 8 and Grade 10 and they impressed upon their children to study, study and study. This probably led to an interest in education. My career path has been through social development initially, then leading a large early childhood development (ECD) organisation in Cape Town and then in 1994 founding the Centre for Early Childhood Development. Throughout this period I lectured at the University of Cape Town where I have been Adjunct Associate Professor in Social Development since January 2009. 2) What does your average week look like? The beauty of working at the same time in social development, education and the academic environment is that there is no “average week”. In any one week I can visit ECD centres, speak to parents and caregivers, assist with developing a management programme, teach 110 students in political economy, meet with donors, write an article for publication, consider how to structure our investments, supervise post-graduate students and then celebrate success with my colleagues. Every week is busy but I try to make time each day to think about what we are doing, how we are do what we do, and how we are going to get to where we want to be. 3) While I’m sure you’ve read many books and articles in your career, if you had to pick two or three that have been especially influential for you which two or three would they be and why? The most important book I have read has to be “Up the Organisation” by Robert Townsend (1970 and reworked in 2007). It is sub-titled “If you are not in business for fun or profit what the hell are you doing here?” He was a business man who led Avis Rent-a-Car. It has great advice such as “Don’t have assistants, give people real jobs”, “Lawyers are a liability”, “Don’t have reserved parking space for the boss” “Don’t have a mistress”, “Keep your promises”, “Small companies should be fun” and “Abolish your public relations department”. The other book is “What would Google do?” by Jeff Jarvis (2009). It gives the reader an insight into how to run a company or organisation and it asks and answers the most urgent business questions of today. The third book is “Outliers: The Story of Success” by Malcolm Gladwell (2008) which tells about extremely successful people and focuses on intelligence and ambition. 4) Who do you think are the current two or three most influential/eminent thinkers in your field and why? In the early childhood development field internationally it is Professor James Heckman, Nobel economic s laureate of 2000. His work has influenced the field tremendously. In South Africa, Linda Biersteker has been very influential. She is a close colleague. Sadly, there have been and still are a number of negative influences in the ECD sector, individuals who do not have the interests of children at heart. Some have moved off the scene but some still remain. 5) What do you think is the most under-researched area in South African education? In the ECD sector we have research, some very good and some really bad. What bothers me is that there is no link between research evidence, policy change and programme implementation. So we know how many children there are, what they need and how the country can provide it. But government does not use it, or avoids acting on the research which does exist. We do not need another study on the importance of ECD, this has been done. Probably the most needed research is on how do we turn what we know into action? 6) What is the best academic advice you’ve been given? My third daughter Catherine, who is a final year BEd student at Stellenbosch University gave me the best advice ever. She said: “Before you walk into the lecture theatre make sure that your fly is done up”. I have followed this advice religiously. 7) If you ended up sitting next to the Minister of Education on a plane and she asked you what you think are the three biggest challenges facing South African education today, what would you say? The biggest challenge is getting the political will of government to improve education. I believe that the political will to improve education is not there. The second challenge is to ensure that every school in the country has the basic infrastructure to function. This means classrooms, qualified teachers, textbooks, desks amongst others. This is linked to political will. The third challenge is to ensure that every child enters Grade 1 having had maximum opportunities to grow and thrive in a quality early learning environment. 8) If you weren’t in education what do you think you would be doing? Probably a professional sportsman. I played soccer representing South African Universities over a period of 7 years, I was South African Universities Heavyweight boxing champion, I have run marathons including TwoOceans and Comrades, I have completed the long-distance Ironman Triathlon so I guess a professional sportsman. 9) Technology in education going forward – are you a fan or a sceptic? I am enthusiastic about technology, I encourage students to use technology in the lecture theatre during lectures. For instance if we want to know the adult literacy rate in India I ask students to find this out whilst I talk. However, the greatest technology lies between our ears but we do not seem to use it. 10) If you were given a R5million research grant what would you use it for? I would assemble a dream team of education people (this is Dylan Wray’s idea) and give them two weeks to complete a plan for how to get quality education to every children in South Africa now. The balance I would give to them to start to implement the plan. One or Eric’s recent (2012) articles discusses the “Challenges facing the early childhood development sector in South Africa” (co-authored with van Niekerk & Ashley-Cooper). For more research see here. Some of the other academics/policy-makers on my “to-interview” list include Servaas van der Berg, Martin Gustafsson, Thabo Mabogoane, Veronica McKay, Hamsa Venkatakrishnan, Volker Wedekind, John Kruger, Linda Biersteker, Jonathan Jansen and Jon Clark. If you have any other suggestions drop me a mail and I’ll see what I can do. This entry was posted in Q&A. Bookmark the permalink. You definitely want to interview Prof Wayne Hugo. If you want more insights into Emancipatory Education with a specific focus on what is happening in rural schools, then interview Jane Pennefather from UKZN. Some of the best educationalists I have know and learnt from. Nic, this was great interview. Thank you for introducing us to some really interesting people.